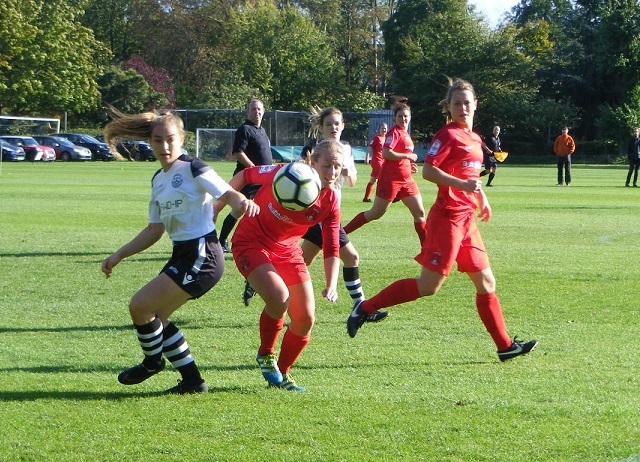 It’s FA Cup weekend 2nd Round Qualifying 60 ties taking place with the FAWNL Division One sides entering the competition, has thrown up several interesting looking ties, Women’s Football East is spoilt for choice, heading to Cambridge this Sunday to watch Cambridge City Ladies v Leyton Orient WFC. So much for summer the first weekend in autumn beginning with a blanket of heavy rain moving across the country overnight and lasting long into the day, the sun should be out by kick-off by it’s a question of whether the pitches will hold up or not? Cambridge City Ladies go into this Sunday’s 2nd Round Qualifying tie in fantastic form, leading the ERWFL Premier Division just below the FAWNL with a 100% win rate from 5 matches played 3 league games along with two victories in the earlier rounds of the FA Women’s Cup, a 2-0 success away to Newmarket Town Ladies in the Preliminary Round then a 14-0 win against Cambridgeshire Premiership side Riverside Ladies in 1st Round Qualifying, a few hundred pounds collected in prize money already the winning side receiving £450 today. 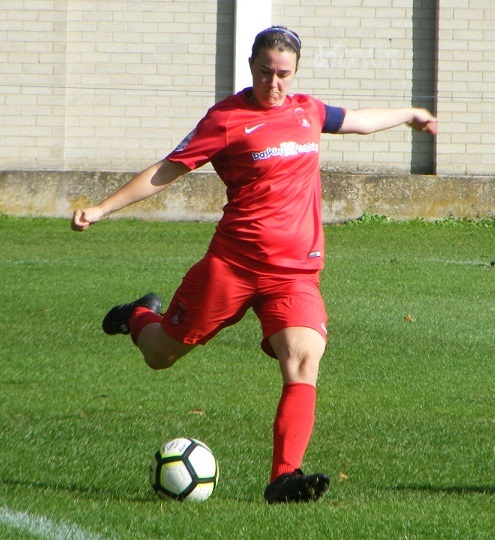 Looking to build on their debut season in the ERWFL Premier Division where they clinched runners-up spot last season, Cambridge City have bolstered their squad bringing in striker Shannon Shaw who was prolific in front of goal for Cambridgeshire Premiership side, March Town United Ladies last season. 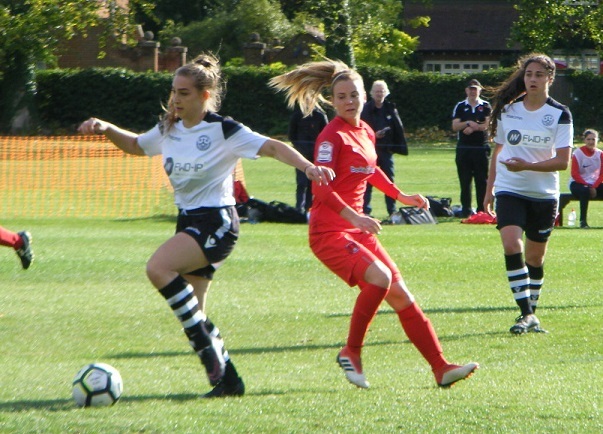 Hannah Bodily returns after a previously playing for Bedford Ladies as does Sofia Castiglione who was with Ipswich Town Women’s academy side last season. Leyton Orient WFC have faced Cambridge City once before in the FA Women’s Cup, a 3-1 success in the 2016/17 season as they went on to achieve promotion to the FAWNL (FAWPL as it was then). 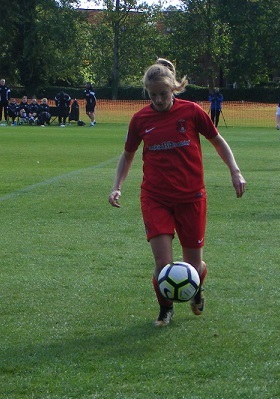 Leyton Orient WFC progressing well enjoyed a strong debut season amongst the South East Division One front-runners for much of the campaign. After 5 matches this season are currently fifth in the table early stages the two promoted sides Crawley Wasps Ladies and Billericay Town Ladies setting the pace, those behind such as Leyton Orient more than capable of chasing them down. Entering the FA Women’s Cup in 2nd Round Qualifying along with the rest of the FAWNL Division One clubs. Both sides stronger than they were two seasons ago. The venue for today’s FA Women’s Cup tie, Trinity College Sports Ground. One of several college/university sports grounds dotted about the city. Very much in the heart of the university quarter I’ve seen Cambridge City several times recently but never at home. Must confess to not enjoying driving in Cambridge but I know that part of the city well. Heavy rain falling all morning it was questionable as the whether the game would be on but more or less as I arrived the rain stopped and the sun came out as predicted. A pavilion overlooking the pitch serving hot drinks, the playing surface itself in excellent shape and had absorbed the rain well. The umbrella wasn’t needed afterall. 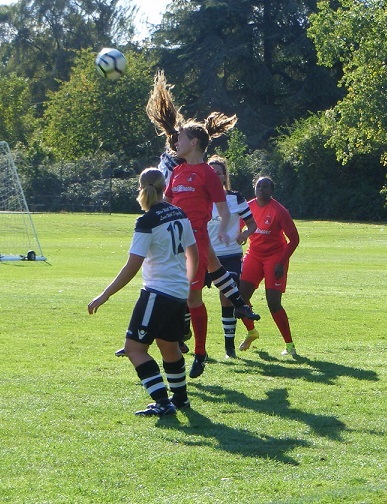 Cambridge City Ladies starting XI – Tafadzwa Mhundury, Amy Reed, Lauren Tomlinson, Becca Fay (C), Robyn Phillips, Hannah Bodily, Sofia Castiglione Charlotte Gillies, Laura Mills, Sarah Mosley & Shannon Shaw. Subs – Carla Penny, Anna Kanz, Anna Goggin, Bella Simmons. 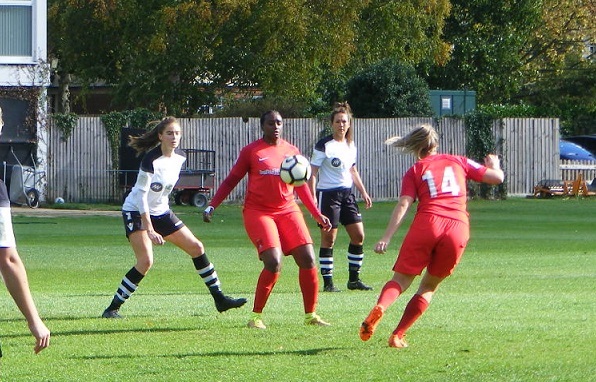 Leyton Orient WFC Starting XI – Naomi Ogunde, Francesca Cagetti, Kathryn Canavan, Hannah Porter, Chloe McNee, Danielle Griffiths (C), Lisa Holmback, Tara O’Halloran, Rebecca Hirst, Sophie Le Marchand & Lisa Fulgence. Subs – Connie Monteil-McCann, Belen Ripoll-Douton, Egle Trezzi, Jade Henry & Lydia Cooper. Two ex-Cambridge graduates lining up for Leyton Orient this afternoon, club captain Danielle Griffiths and Rebecca Hirst having studied in the city. It’s the visitors to kick-off the first half Leyton Orient wearing an all red kit with Cambridge City lined up in their home colours white shirts with black across the shoulders, black shorts with black and white hooped socks. A cautious start Leyton Orient probing both flanks, Cambridge’s full backs Amy Reed and Lauren Tomlinson dealing with the threat. 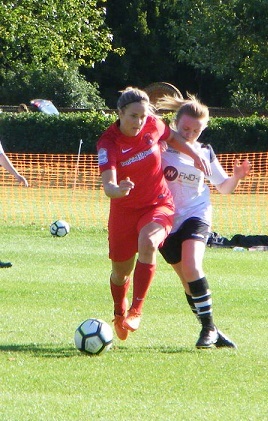 Lisa Holmback busy in the centre of midfield early on for Leyton Orient winning the ball brings it on before looking to send Sophie Le Marchand through on goal as she makes a run inside from the left the pass a little too heavy allowing Cambridge goalkeeper Tafadzwa Mhundury to collect. Le Marchand looking for the ball on the left wing collects from a throw turning inside shifts the ball, a drop of the shoulder and she moves to the byline, Cambridge captain Becca Fay staying with her prevents the cross coming in. Leyton Orient press the ball Cambridge not getting any momentum going forwards, Tara O’Halloran on for Holmback she lofts the ball forwards into Lisa Fulgence central back to goal holds it up before laying it out to the right for Rebecca Hirst closing in a strike goalwards from outside the area the ball running wide across the six yard box. A good start from Leyton Orient, Le Marchand finding space drifting inside especially when the ball is played up to Fulgence. The ball falling to her 25 yards out Le Marchand fires a shot in towards the Cambridge goal dipping Mhundury is right behind it takes it low. Cambridge find a little joy out on the left as Shannon Shaw comes across to pressurise the Leyton Orient defence, does well as Laura Mills coming in nips in to steal the ball running in behind lifts a cross into the box the ball intercepted and cleared by Chloe McNee for Leyton Orient. GOAL! Leyton Orient capitalise on their good start to the game by taking an early lead in the 7th minute, attacking push bodies forwards from midfield overwhelming the Cambridge defence Le Marchand inside to Holmback strikes the ball form 20 yards her vicious effort blocked rebounds back out to O’Halloran to her right she fires in another shot, Mhundury having reacted to Holmback’s effort is unable to adjust getting a glove to the ball can’t keep it out at the near post 0-1. Holmback very influential in the early stages for Leyton Orient winning the ball in the middle Cambridge are struggling to get anything going, direct in their approach it is effective from the visitors Hirst and Le Marchand getting forwards quickly. A following attack from Leyton Orient as Le Marchand comes on with the ball left twists and turns coming in field laying the ball into Fulgence central held up the striker plays the ball back to Holmback who in turn has O’Halloran in support to her right giving her the ball O’Halloran has seen Le Marchand’s run into the box look to play the ball over the top of the Cambridge defence, just a little too much on it for Le Marchand to turn home as she can’t gather the ball before it runs out of play, a good attacking move. Trying to build going forwards Cambridge are frustrated nothing coming off, Kathryn Canavan and Francesca Cagetti both tackling to prevent crosses. Mills puts a ball in early from the left Charlotte Gillies out wide right gathers looks to send a cross in along the goal face Canavan blocking the ball behind for a corner. Leyton Orient deal with the Cambridge set-piece. Mills holds up the ball on the left wing as Tomlinson comes racing past her gathering the ball heads for the byline, Cagetti staying with her slides in to make the tackle. Le Marchand always ready to go on the left claims the ball turns and runs into the corner whips a great ball in across the face of the Cambridge goal no one there to turn it home. Fulgence comes deep to the halfway line to receive the ball, tries to flick it on for Le Marchand catch Cambridge with a high defensive line, Robyn Phillips does well making the challenge to prevent Le Marchand getting away with the ball. Shaw moving into the left channel gathers the ball tries to send it back inside towards Sofia Castiglione making a central run, McNee stepping out of the Leyton Orient back-line to deny her a strike. A good tempo the the match Leyton Orient controlling it is limiting Cambridge’s effectiveness going forwards play mostly to their left. Chances few and far between Shaw collecting from a throw on the left spins and shoots from the angle her shot half blocked deflected wide across Ogunde’s goal. A free-kick wide left for Cambridge in the corner played back up the line to Tomlinson she hits it hard, the only reason I know that is because Leyton Orient’s O’Halloran rushing towards her blocks it and needs treatment as a result. But she is okay to continue. GOAL! Closing in on the half hour and Leyton Orient double their lead. Le Marchand the scorer Leyton Orient counter attacking get the ball up front quickly central a difficult bouncing ball to deal with at the top of the area Le Marchand in close making thing’s difficult muscles her way past the defence the ball at her feet drives it low past Mhundury into the back of the net 0-2. Nothing Cambridge try will come off, Shaw looks to link up with Gillies on the right as Castiglione plays the ball forwards, Canavan getting hold of the ball setting Leyton Orient on the counter through the middle up to Le Marchand sweeps the pass out to Fulgence right side top of the area her strike goalwards claimed by Mhundury at her near post. Again Leyton Orient break from a Cambridge corner Le Marchand left firing a diagonal ball into Fulgence, Fay nipping in to push the ball away O’Halloran picks it up drives forwards top of the area looking for options over taking a shot tries to slip the ball in behind for Fulgence right can’t find her, the ball cleared only to Hirst wide right her cross in lands on the roof of the net. Reed defends up against Le Marchand as she tries to get inside her on the left in attack. Getting numbers forwards Leyton Orient press high. Sarah Mosley back to defend for Cambridge clears the long on the right Gillies giving chase, Hannah Porter getting across her does well to see the ball back to her keeper. Holmback fouled on halfway, Griffiths to play the ball long up towards the top of the Cambridge box, Fay with a commanding header clears the threat. Le Marchand with a strong run inside from the left into Fulgence back to goal attempts to flick it on into the box with Holmback making a good run doesn’t quite come off. GOAL! 2 minutes of normal time left in the first half and Cambridge pull a goal back with their first shot on target. A superb run and goal from Laura Mills on the left picking the ball up wide left drives forwards coming infield towards the area rides two challenges powering her way into the box before striking the ball past the static Ogunde into the back of the goal 1-2. More or less the last goal mouth action before the end of the half. 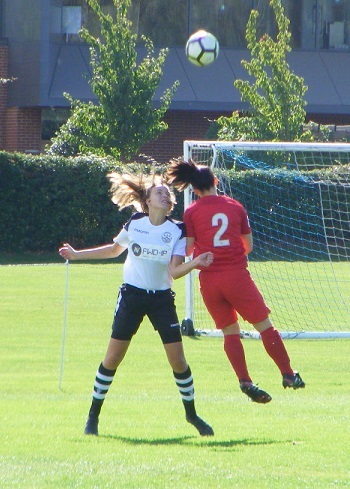 Laura Mills pulling it back to 21 late in the 1st half for Cambridge City. A vital goal for Cambridge City coming right at the end of the first half to pull it back to 2-1. Leyton Orient by far the better starting well and taking an early lead pressed the ball well, direct at times but effective, attacking quickly in numbers, Le Marchand in particular finding room using the ball well. Set the tempo and Cambridge struggled to get anything going their late goal altering thing’s dramatically going into the half-time break. All to play for 2nd half. No changes for either side Cambridge getting the 2nd half underway. Castiglione putting a ball long for Hannah Bodily to give chase to through the middle, dissecting the Leyton Orient defence, but not fooling Ogunde who is positioned well to gather. A blow to the head for McNee she needs treatment but can return to the pitch. O’Halloran with a shot well of the mark as Fulgence wins the header forwards knocking the ball into her 30 yards out. Shaw plays the ball out to Gillies deep on the right wing she is tackled by Canavan the throw-in conceded. GOAL! Cambridge equalise bringing the scores back level 5 minutes into the 2nd half the goal coming from the throw-in the ball crossed in along the top of the area Mills getting in front of her marker left side knocks the ball down sees Mosley in a great position 20 yards out lays the ball into her Mosley strikes the ball sweetly it flies in towards goal past Ogunde before she can get anything on it. 2-2. 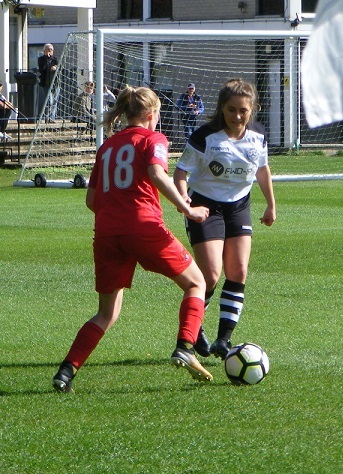 Tomlinson with an important interception getting her foot up to cut out a lofted ball forwards from midfield from Leyton Orient with Hirst all set to run clear in behind. The visitors with a golden chance to restore their lead Le Marchand running in on the ball played into her as she breaks in behind left, Mhundury coming out to close her down Le Marchand clever knocks the ball past her towards goal. Hirst is central inside the six yard box, can’t dig the ball out of her feet to get the shot away before Phillips closes her down makes the challenge. GOAL! Leyton Orient do succeed in retaking the lead the goal coming from a corner won by Le Marchand on the left as Griffiths sends the long diagonal pass out to her. Players forwards inside the box as the delivery is put in a great ball across the face of goal, O’Halloran clear at the far post nodding the ball in from close range to make it 2-3. Leyton Orient look to press their advantage coming forwards win a free-kick wide right inside the Cambridge half Griffiths to put the ball into the box good flight on the ball Mhundury is able to catch the ball unchallenged. Le Marchand with the ball, draws the foul wide left this time another good ball into the area a crowd around the penalty spot a Leyton Orient head connects with the ball the attempt dropping wide of the far post. Leyton Orient make the first change of the match bringing on Lydia Cooper for Hirst on the right. Cooper involved straight away as Holmback plays the ball out to her on the wing she gives chase but a good starting position from Mhundury sees her able to gather the ball first. GOAL! Cambridge come back to equalise again 6 minutes after conceding they build on the right side Gillies having more of the ball 2nd half gets on down the line getting her foot around the ball sends a dipping cross into the six yard box, Shaw timing her run perfectly getting in to met the ball low and turn it into the back of the net from close range 3-3. Leyton Orient have a free-kick wide left. Cambridge make a change before it is taken Mosley coming off on comes Carla Penny taking up a role wide left. The free-kick played down the line the cross put in near post Fulgence can’t bring down for a shot instead lays it back towards the top of the box with McNee running in her strike wide across the goal. GOAL! For the 3rd time in the match Leyton Orient take the lead O’Halloran sending a long ball out to the left for Le Marchand to race onto in behind Mhundury comes racing out to close her down once again, the attacker taking on the shot early gets it in on target may have taken a slight deflection off the keeper as it runs slowly towards the open goal but despite the best efforts of the Cambridge defence none can catch up to it before it crosses the line 3-4. Gillies with a long range pop sends a low strike from 30 yards out on the right wide across the Leyton Orient box. Mhundury gets down sharply inside her box to claim the ball as Leyton Orient create on the left the ball helped in by Fulgence, Holmback behind knocking the ball into the box as she looks to beat her marker. Griffiths across well on the cover to defend as Mills sends a ball long up the right for Shaw to chase the defender playing the ball safely back to her keeper. GOAL! For the 3rd time in the tie Cambridge come back for score the equaliser. Comes from a free-kick wide on the right the ball played up towards the top of the area several forwards for Cambridge. Blocked by Canavan the rebound runs back to Mills 25 yards out strikes the ball well on the angle driving it low across the keeper and into the far corner 4-4. Cambridge make a 2nd change Bella Simmons entering the action replacing Shaw up top. Leyton Orient bring off Canavan, send on Egle Trezzi. Tomlinson has bionic arms (maybe) nevertheless has a good long throw in her armoury when Cambridge can get her into an advanced position she offers an added threat gets the ball into Mills top of the area she turns inside closely marked plays the ball on, Griffiths intercepting hooks the ball clear for Leyton Orient. 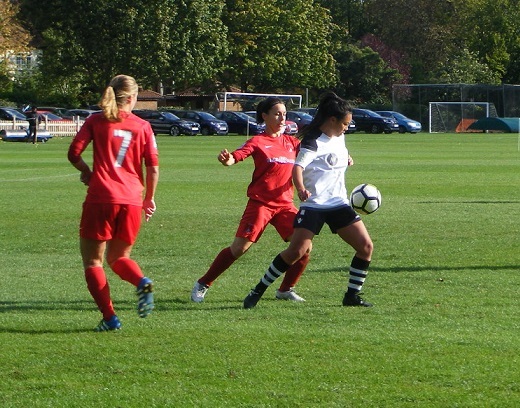 Carla Penny bringing the ball under control for Cambridge City. Up the other end Tomlinson gets back in support of Fay as her captain is muscled off the ball by Fulgence looking to turn and run in behind the fullback making a good challenge. The game naturally becoming a little stretched late on both sensing they can score another, Leyton Orient feed Le Marchand on the left driving down the wing squares the ball in near post Fulgence with the run is closed down by Mhundury the keeper doing enough as Fulgence puts the ball wide. Tomlinson with another chance to deliver a long throw Leyton Orient wary of the threat the ball comes in Gillies gets her head on it directs the attempt wide of goal. A free-kick wide left for Leyton Orient, Griffiths to play the ball in sends it long across the six yard box no one gets a head on it as it runs out of play far post. A final change for Leyton Orient in attack, off comes Fulgence replaced by Jade Henry. Le Marchand always ready to break in behind off the shoulder of the last defender on the left the ball long up to her Mhundury comes again, Le Marchand shoots, the keeper making the save with her legs as she jumps in front of the attacker. GOAL! Cambridge take the lead for the first time in the tie! The game stretched in the closing minutes Leyton Orient pressing Tomlinson gathering the ball at left back sees space open up in front of her goes on a brilliant run carrying the ball 3 quarters of the pitch up the left crossing from the byline a fizzing effort racing across the face of goal, Simmons sliding in at the far post turns the ball in at close range 5-4. For the first time in the game Leyton Orient are behind with minutes left on the clock push forwards attacking left side the cross swung in Henry with the knock down near side to Le Marchand top of the area she puts her foot through the ball but can’t keep the effort down as it flies over the crossbar. It’s all about composure now Cambridge are looking to seeing it out the adrenaline pumping not an easy thing to do into stoppage time Leyton Orient come on can find no reply as Cambridge complete a memorable result to win the match. What a game! That 2nd half was something else I’m perhaps the only neutral there but how can you not be emotive watching games like that. Cambridge coming back to equalise 3 times in the match before going on to score what proved to be the winning goal themselves to advance in the FA Women’s Cup. Showed good character to keep coming back were lacklustre in the first half not getting anything going but never out of the tie. Leyton Orient will be deflated, can only be so after taking the lead 4 times in the match and failing to go on and win it going behind themselves with so little time left. On to this afternoon’s Women’s Football East – Player of the Match. Several good performances from both sides, Le Marchand excellent for Leyton Orient a threat all game, Holmback in the middle especially 1st half, O’Halloran too. Tomlinson was excellent at left back for Cambridge and a great run and cross for what proved to be the winning goal. It was another goal that changed the course of this tie however and that was Cambridge’s first coming so late in the 1st half was vital pulling it back to 2-1 was so critical gave Cambridge that belief, and for that plus another and an assist today’s Player of the Match award goes to Laura Mills. What an exciting game to watch a privilege and it’s why I love the sport so much. My thanks to both managers for their help with the teams and Cambridge City for their hospitality. Thanks to for the weather a bright sunny afternoon after such a dismal start a welcome bonus. 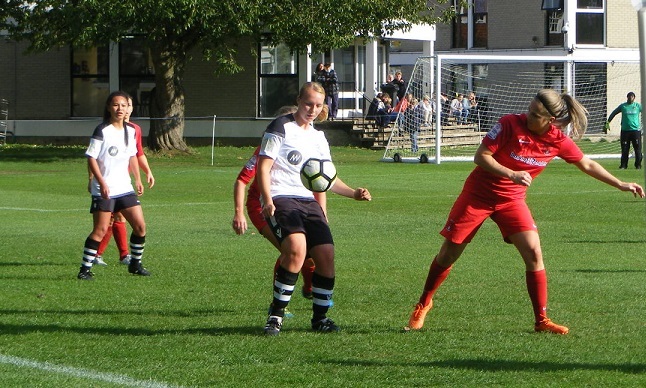 This entry was posted in FA Women's Cup, Match Reports and tagged Cambridge City Ladies, FA Women's Cup, Leyton Orient WFC, Match Report on September 23, 2018 by WFEast. Great fa cup report!!! Do you do a round up of the Essex Prem & Div 1 teams after every weekend? Sun 23rd Sept! Many thanks for the reply.. always a great read!